It is well established that today’s generation of young voters – the Millennials – are the most pro-EU since Britain joined the European Economic Community in 1973. Even as support for membership of the EU has fluctuated over time, the Millennials have been by far the most supportive. The campaigns ahead of the referendum on the 23rd of June are well underway. Against the backdrop of opinion polls showing a small gap in support between the ‘Remain’ and the ‘Leave’ camps, a serious consideration for both sides is the extent to which the Millennials’ inherent support for the EU will translate into votes on polling day. With the help of YouGov, we asked Millennials about their support for EU membership or withdrawal, and their likelihood of voting in the referendum, and compared their responses with those of their elders. The headline figures are consistent with those found in other surveys; the Remain campaign has a slight lead, with 45% of voters supporting Britain’s continued membership of the EU, and 41% wishing to leave. However, as the graph below shows, these figures hide considerable variation between generations of British voters. Support for continued EU membership is heavily concentrated among the younger citizens. 60% of the Millennials plan to vote to stay in the EU, compared with only 24% who support leaving; among the Pre/Post-War generation, the picture is reversed, with 54% supporting withdrawal and 35% supporting continued membership. Britain’s EU membership is an issue around which generational disagreement is particularly stark, suggesting this referendum could well split young and old in a way rarely seen in relation to other political issues. However, voting intentions tells only one side of the story. 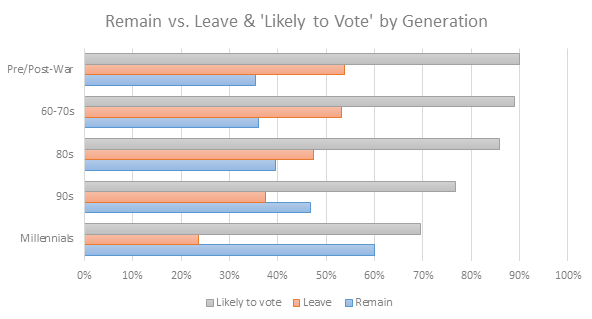 The graph also shows how likely each of the generations are to vote on the day, which provides a more sobering conclusion for the Remain campaign. Respondents were asked how likely they were to vote in the referendum on a scale from 0 (meaning ‘certain not to vote’) to 10 (meaning ‘certain to vote’). Identifying anyone who answered with a score of 7 or more (in other words, anybody who reported a greater than two-thirds chance of voting) as being highly likely to vote, the graph shows that the Millennials’ support for EU membership will probably be under-represented when the final votes are counted. While the vast majority – 70% – are highly likely to vote, this compares with an average of 88% among the three oldest – and most Eurosceptic – generations. One in ten Millennials also reported being certain not to vote, compared with an average of 4% among the older three generations. One of the major challenges for the Remain campaign over the next three months is clearly going to be mobilising their younger supporters to actually turn up to vote on polling day. The Leave campaign may also find some value in reaching out to Millennials – one in four Millennials who are likely to vote wish to leave the EU. However, their best interest probably lies with trying to rally more of the Eurosceptically-inclined older generations to their cause. Now let’s see how many Millennials – and older voters – are likely to be receptive the efforts of the two campaigns. Not all eligible voters will turn up on 23rd June, and many have already decided how they are going to vote – such people are unlikely to respond to the approaches from the Remain and Leave campaigns. If we group our respondents on the basis of their support for staying in or withdrawing from the EU, their certainty of that support, and their likelihood of voting, we can get a rough idea of both how big the pool of voters who may respond to the two campaigns actually is, and of how many Millennials might be persuaded to vote on polling day. Table One shows four groups of voters. The ‘Committed’ are those who are highly likely to vote and are certain they know how they will vote. 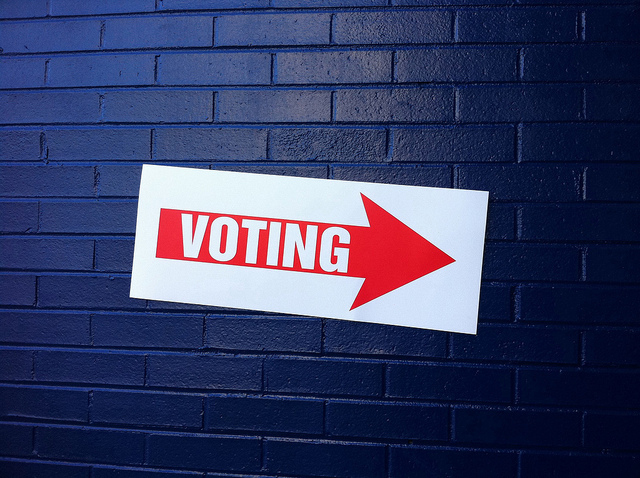 ‘Uncommitted’ voters are highly likely to vote, but are not yet certain how. They may be leaning towards remaining or withdrawal, or they could have no idea at all. ‘Possible’ voters might support either ‘remain’ or ‘leave’ (or not know), but their defining feature is that they are only moderately likely to vote at all (i.e., they gave a score between 5 and 6 on the 0 to 10 vote likelihood scale). Finally, the ‘Unengaged’ voters could also back ‘remain’ or ‘leave’ (or not know), but are highly unlikely to vote (i.e., gave a score between 0 and 4 on the 0 to 10 scale). The table shows the proportion of respondents, and of each generation, who fit into each group. The ‘Total’ column shows, perhaps surprisingly at such an early stage of the campaign, that the ‘Remain’ and the ‘Leave’ camps are fighting over a minority of voters. 50% are already certain of how they will vote in the referendum and are very likely to turn up. The key target group for the two campaigns is the ‘Uncommitted’ voters; one in three are currently highly likely to vote in the referendum, but have yet to fully decide which side to back. That said, most are leaning one way or another; 43% currently support staying in the EU, and 38% support leaving. The campaigns may also have some success with the 8% of ‘Possible’ voters provided they can persuade then to turn out. However, they should be of more interest to Remain than Leave, as 41% of them support EU membership compared with just 26% who want to leave. Finally, just over one in ten voters can be described as ‘Unengaged’ – they are highly unlikely to vote in the referendum. In terms of support for Remain or Leave, these groups are not evenly spread across the generations. The older generations are the most likely to be committed to a position and to voting; on average, 56% of the most Eurosceptic generations (the 80s, 60s-70s and Pre/Post-War) are committed voters, compared with just 40% of Millennials. Roughly one in three Millennials are uncommitted to either side but are likely to vote (this is similar to the proportions in the other generations). However, the other stand out group of Millennials is the unengaged; almost one in five Millennials are highly unlikely to vote in the referendum and to have a view about Britain’s EU membership. This group is also unlikely to be interested in politics more broadly: when asked to rate their attention to politics on a scale from 0 (meaning they pay almost no attention to politics) to 10, the average score for these Millennials was 3.6, compared with 7.2 among ‘Committed’ Millennials. A substantial proportion of this generation – far greater than any other – are largely unengaged with the referendum, and this reflects their lack of political engagement more broadly. The Millennials, therefore, present both a challenge to and an opportunity for the Remain campaign, in particular. They are by far the most pro-EU generation in the electorate, and make up a significant chunk of support for Remain. On the other hand, they are the least likely to vote, and some are disengaged from the referendum altogether. The Remain campaign is far more dependent on the ‘youth vote’ than Leave. While polls currently show a consistent lead for Remain, a lot could happen in three months which could make the Millennials’ below-average turnout a serious problem for those wishing to stay in the EU. The challenge and opportunity for the Remain campaign is to capitalise on the Millennials’ inherent pro-EU outlook and mobilise as many as possible to vote in the referendum, without having to worry quite as much about persuading them of the case to stay in the first place. Should the Remain campaign be successful in mobilising the Millennials to vote in June, they be successful – and our data at the end of the campaign will help us assess the extent to which they were – we might see the boost in political engagement and participation among the young similar to that which followed the Scottish Independence Referendum.